All my engaged friends lament about the insane cost of weddings. They need to reconsider their options, though. Apparently they just need to move to Russia and marry the son of an oil tycoon — because they might get 1 billion dollars to pay for the most lavish wedding ever. At least that’s what happened last week when the son of Mikhael Gutseriev, worth $6.2 billion according to Forbes, got hitched. 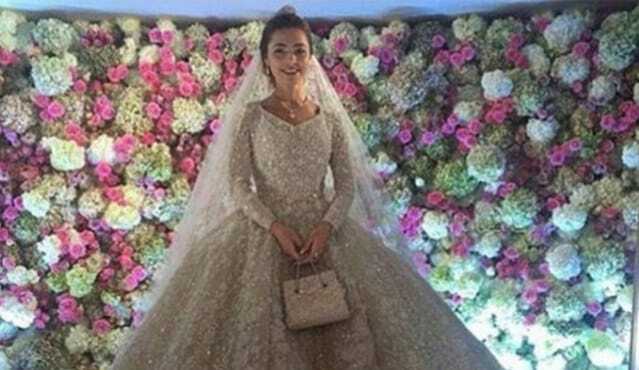 Said Gutseriev, 28, married Khadija Uzhakhova, 20, in a wedding that’s been estimated to cost nearly $1 billion. Even for a billionaire, that’s insane. Here are more details on the absurd affair. How the Heck Did They Spend $1 Billion on a Wedding? So, how does one spend a billion dollars on a single event? It’s pretty easy, really. Give them each a gold box inscribed with your names, because why not? Yep, the wedding included performances by Jenny from the block, Enrique Iglesias and Sting. And the couple had a second wedding in London the week after. What if you’re not looking to spend a billion dollars? Your Turn: What do you think of this wedding? Was it a waste of money or a fairy tale?